Jim Warner is the author of two poetry collections Too Bad It’s Poetry and Social Studies (Paper Kite Press). His poetry has appeared in The North American Review, Word Riot, Drunken Boat, PANK, and elsewhere. 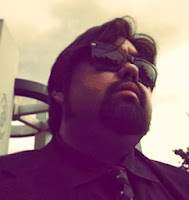 He writes for Neotorama and the blog ‘Best Worst Year’ for Sun Dog Lit. He is also the Managing Editor for Quiddity. You can find Jim Warner on Facebook, and on his blog. Heather conducted this interview with Jim via email. HL: What is Quiddity International Literary Journal and Public Radio Program? JW: Quiddity is a multi-discipline arts showcase featuring an international literary journal—print and audio, a public-radio program in partnership with NPR member/PRI affiliate WUIS, Illinois Public Radio’s hub-station, and a visiting writer and artist series. Each is produced by Benedictine University. Currently, Quiddity is published semi-annually, the radio broadcast is monthly, and we have two to four events on our Springfield campus a year. What do your tasks include? I am the Managing Editor here at Quiddity. I oversee the day-to-day operation of the journal. I’m also in charge of our social media platforms. 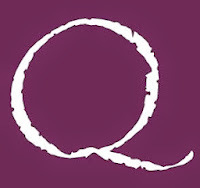 Shameless plug: Follow us on Twitter @QuiddityLit, read our Tumblr, and like us on Facebook. With our Tumblr, we’ve begun to develop exclusive programming including The Editor’s Podcast and 5 Q 4 Q [5 Questions for Quiddity], as well as posting more candid pics from the office. We want our readers and those submitting to Quiddity to know us, put a name to a face—that way we feel more connected as a community. I guess it’ll also be harder to hide from people who get rejection letters… hmm… Note to self: dye my hair before AWP 2k14. What does a day in the life at Quiddity look like? Wiffleball, lots of wiffleball. I don’t think there’s a typical day here, which is why I love what I do. Today, I’ve been here since 7 this morning working on audio production for an upcoming radio show, drafting interview questions for Rae Bryant, going over cover proofs of Issue 6.2, and ordered Quiddity buttons from Columbus, Ohio’s finest, Jimmy Buttons. It’s not even 10 a.m. I’ll probably be here until 4 and I haven’t even harassed our editors yet. How do you balance your time as editor with your own writing projects? Well, last week, John and I stayed late at the office and spent a couple of hours eating pizza and sending out poetry to magazines. I think the wholesale changes which have gone on in my life—new job/new city/new car/new appreciation for the work of Philly rockers The Hooters—has helped put my writing life into sharper perspective. I used to let the boundaries between life and work blur to the point of it not being able to disengage. It’s hard when you have a job you love and it is also tied into your passion. It’s a good problem to have—believe me, but all the same, when I go home, I go home. It’s taken me a long time to learn that lesson—giving myself permission to be off the clock. Writing is work to me, too, and in the past, I ended up seeing it as an extension of my workday. Now, I’m more mindful of those boundaries, and I think I’m all the better for it. I also have a pretty regimented life schedule now—wow, that sounds thrilling, no? So much for my rock n’ roll poet cover. Guess I’ll go back to awkward Pinoy with the great sideburns. My writing time is mine alone. In a lot of ways, it comes first. It is the first thing I do in the morning and typically it is the last thing I do at night. I’m just lucky enough that in between the two I get to be in a place which fosters that love. Where do you hope to see Quiddity in the next five years? Paris. I’ve never been to Paris. What does the public radio program aspect offer readers and listeners? Any time you can widen the width of the net you cast for art the more likely you’ll expose somebody to an experience, which will enrich the community as a whole. Working in partnership with WUIS is a natural fit. An NPR listener probably already has an appreciation for the arts, so having our monthly program means more exposure to our journal. One doesn’t have more weight than the other. I believe Quiddity wouldn’t be Quiddity if it was only in print. Also, our show is available through PRX (The Public Radio Exchange), which handles NPR shows like The Moth, All Songs Considered, and WTF (radio edition). What are some issues you face in gaining readership? Well, again, I think it’s important for us, as a literary outlet, to seek out our readers. Like a published author, you can’t just wait for readers to come to you. As James Brown says, “You don’t work. You don’t eat.” We are currently looking at offering our magazine digitally. It’s the next logical step for us. What direction, do you think, contemporary poetry is going in? (Indistinct muttering followed by a long awkward pregnant pause where I stare at my shoes with the white hot intensity of a thousand suns—the type of look which hints a burning want for life larger than the confines of a marble blue sky could hope contain but is tempered by a hard luck, world weary wisdom, which hasn’t diminished his lust for living but given him an appreciation for passing days only granted by walking through a dark night of the soul.) North. Do you think literary journals are a good platform for showcasing poetry? Why? What makes a good showcase for contemporary poetry is anything that can bring a community together to engage in a conversation. The best art invokes conversation. Whether it is with you and the artist, you and the piece, or you and your friends over a beverage of your choice (say perhaps a sparkling Perrier in one of those 8.5 oz slim cans). When we are able to establish a dialogue, even if (and maybe especially when) we can’t fully articulate what it is about art that is causing us to engage/disengage, then we are closer to discovering a truth about ourselves and those around us. Conversation leads to connection and connection leads to community. I hope while I’m here to have some good conversations—perhaps even start a few, over—I don’t know, say a sparkling Perrier in one of those 8.5 oz slim cans. What can/does Quiddity offer readers and lovers of poetry? I think Quiddity’s international aspect helps to expand the conversation beyond our borders. It is a place where I hope we can continue that expansion into our radio program. One of the things we have been very mindful of is to be engaged with our contributors. I was reading over some notes, which were sent out to a writer for an upcoming issue, and was impressed with the amount of time and detail our prose editor took in regards to this one piece. As a writer and someone who is out submitting work like everyone else, I would kill for that kind of reply. I think that degree of discourse and connection translates to the experience of the page. Further, by inviting all of our contributors to send us audio of them reading their work, we add another dimension to the Quiddity experience. All we can hope for is that we can provide a multitude of entry points for engaging the work in Quiddity. If no one is standing on your shoulders as an artist or as an advocate for the arts, then you are not doing your job. Do you think a merger of audio and print is a ‘must’ for the future success of literary journals? I think digital media is the future as it is the intersection of the arts. But even as a future, it’s a tricky proposition to say a “must.” There is room for all the ways and means we choose to transmit and disperse prose and poetry. I have a friend who moved to Asheville, NC last year to be in the thick of the letterpress movement. As long as we are creating we will always seek a variety of outlets and audiences regardless of viability or commercial potential. Any other thoughts you’d like to add? Like us on Facebook. Follow us on Twitter @QuiddityLit. Read our QuiddityLit blog on Tumblr. And submit via Submittable! Oh, and I do a weekly column over at SunDog Lit’s blog. It’s called Best Worst Year and has been known to leave your breath minty fresh. Heather Lowery is pursuing her second master’s degree in creative writing from Wilkes University. One of her feature articles, “A scholar of the land, shepherd of the shore,” a personal profile on an Irish farmer, was recently published in Sneem Parish News, an international magazine. Though an award-winning journalist, she has decided to take a break from news to focus on writing a memoir about her relationship with her father.